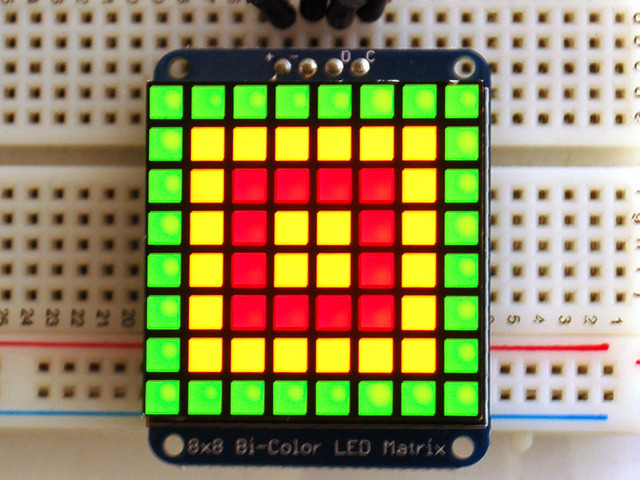 This version of the LED backpack is designed for two dual 14-segment "Alphanumeric" displays. 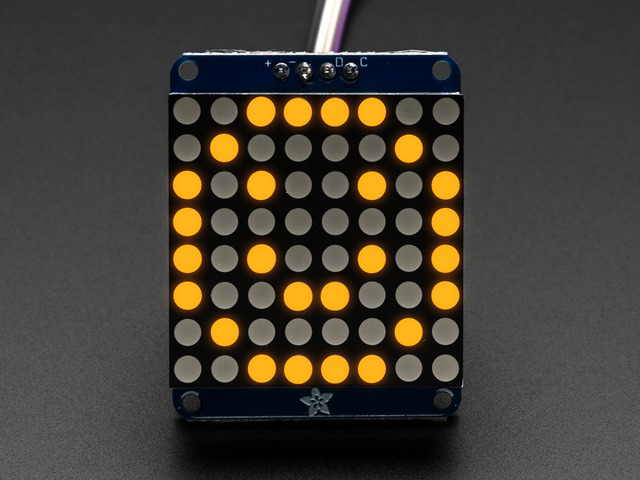 These 14-segment displays normally require 18 pins (4 'characters' and 14 total segments each) This backpack solves the annoyance of using 18 pins or a bunch of chips by having an I2C constant-current matrix controller sit neatly on the back of the PCB. The controller chip takes care of everything, drawing all the LEDs in the background. All you have to do is write data to it using the 2-pin I2C interface. There are three address select pins so you can select one of 8 addresses to control up to 8 of these on a single 2-pin I2C bus (as well as whatever other I2C chips or sensors you like). The driver chip can 'dim' the entire display from 1/16 brightness up to full brightness in 1/16th steps. 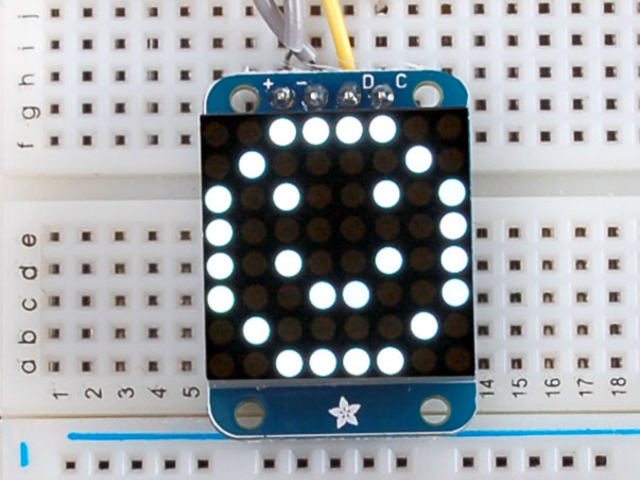 It cannot dim individual LEDs, only the entire display at once. When you buy a pack from Adafruit, it comes with the fully tested and assembled backpack as well as two dual 14-segment display in one of the colors we provide (say, red, yellow, blue or green). You'll need to solder the matrix onto the backpack but it's an easy task. Remove the parts from packaging and place the LED matrices OVER the silkscreen side. DO NOT PUT THE DISPLAY ON UPSIDE DOWN OR IT WONT WORK!! Check the image below to make sure the 'decimal point' dots are on the bottom, matching the silkscreen. Turn the backpack over so it is sitting flat on the matrix. Solder all of the pins! That's it! now you're ready to run the firmware on your Arduino! We wrote a basic library to help you work with the alphanumeric backpack. The library is written for the Arduino and will work with any Arduino as it just uses the I2C pins. The code is very portable and can be easily adapted to any I2C-capable micro. Place the Adafruit_LEDBackpack library folder your arduinosketchfolder/libraries/ folder. 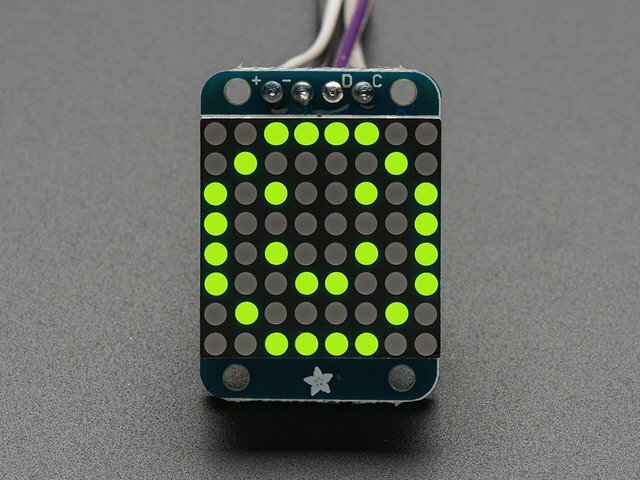 You'll also need to download the Adafruit GFX library - even though this particular backpack doesn't use it! Its just one of those Arduino dependencies! You can grab the Adafruit GFX library from github or download by clicking below. Nex up, let's wire it up to an Arduino. We'll be using an Arduino. Both Vi2c and Vcc MUST be connected to 3 to 5VDC! Vcc is for the LED driver power, Vi2c is what sets the logic level for communication to the chip. Upload to your Arduino, and open up the Serial console at 9600 baud speed. You'll see each digit light up all the segments, then the display will scroll through the 'font table' showing every character that it knows how to display. Finally, you'll get a notice to start typing into the serial console. Type a message and hit return, you'll see it scroll onto the display! For the quad displays, we have a special object that can handle ascii data for easy printing. There's no arguments or pins because the backpacks use the fixed I2C pins. If you're just looking to print 'text' you can use our font table, just pass in an ASCII character! That's what actually 'sets' the data onto the LEDs! This guide was first published on Jul 29, 2012. It was last updated on Jul 29, 2012. This page (0.54" Alphanumeric) was last updated on Apr 19, 2019.